Samantha Kakati is a Non-executive Director on LKMco’s board. 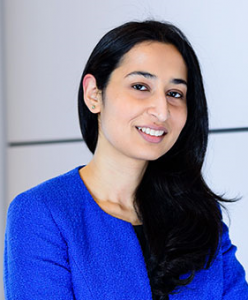 She is an experienced dispute resolution lawyer at law firm Mishcon de Reya, specialising in finance and banking disputes. She provides her clients with technical and strategic advice. Samantha also works with legal technology providers to optimise working practices and client experiences and is involved in developing education initiatives within Mishcon de Reya. Samantha has experience mentoring young people and working with vulnerable women and in promoting discussions on equality. She has also been involved with a number of organisations focusing on social justice and social mobility. She is passionate about helping to build a kinder and more compassionate society. Having benefited from scholarships herself, Samantha believes that access to education and opportunities is key to preparing young people for a fulfilling future.